With a name like that you know it’s good! But this isn’t a “cake” at all, it’s a wonderful mix of grated coconut and sugar baked into a truly delicious delight. A little pink dye is often added for color. Traditional sugar cakes are made with just coconut and sugar (and molasses for brown sugar cakes) but in recent times new flavours have emerged including pineapple, ginger and bay leaf! More ‘cakes’ that aren’t cakes! Peanuts are combined with sugar and baked into this yummy sweet treat. It’s crunchy and sugary… in other words delicious! Any hey aren’t peanuts good for you? 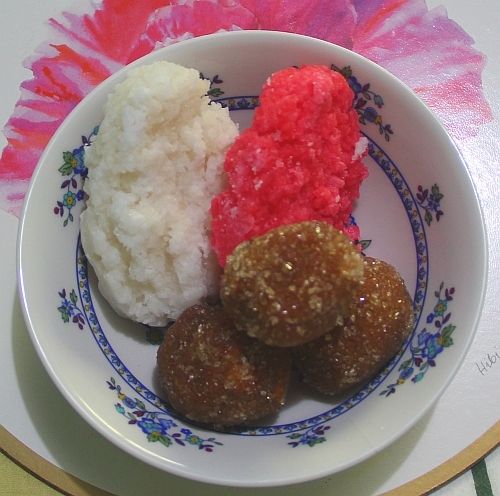 These balls of deliciousness combine the tartness of tamarind fruit (found in abundance in Barbados) with the sweetness of cane sugar. Be careful as most tamarind balls include a tamarind seed in the middle, be sure to eat around this (kind of like unpitted olives) to avoid an unpleasant trip to the dentist! Grated coconut is combined with flour, sugar, eggs, butter, raisins and spices, then dusted with sugar and baked into loaves. Coconut breads are popular throughout the year but especially so at Christmas, where a slice goes nicely with Sorrel, our traditional Christmas beverage in Barbados. Another popular treat is coconut turnovers, a pastry stuffed with sweetened coconut. This author’s favourite sweet treat, comforts are a combination of sugar and peppermint pulled into a light, airy confectionery that literally melts in your mouth. All these sweet treats are available from vendors at festivals & fairs, and in supermarkets and convenience stores. As we said Bajans really enjoy sugary treats, so restricting this list to 5 was no easy task! We could easily have included guava cheese, fudge, jams, and all manner of sweet breads! And we’re sure readers will each have their favourites. So for now, with sticky fingers, we’ll sign off!